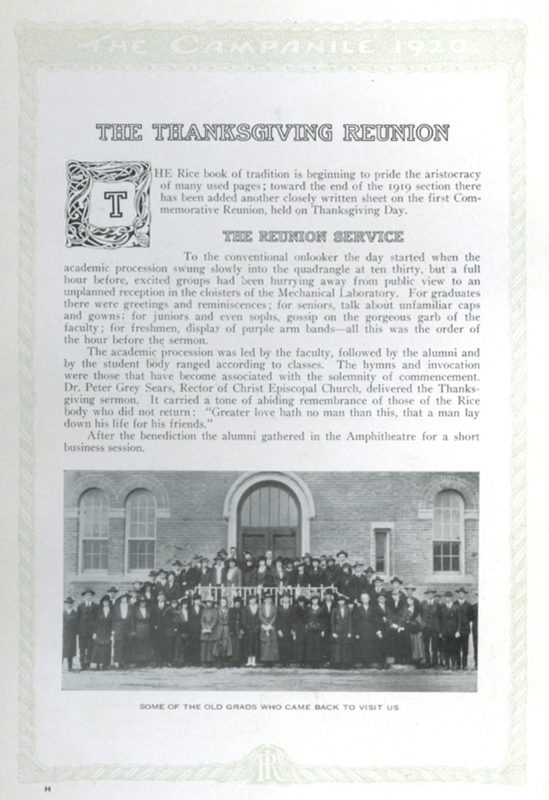 Rice’s first homecoming was held on Thanksgiving Day, 1919. Although in some respects it resembled a modern homecoming, the small size of the alumni body made it an altogether more intimate affair than what we see today. (In 1919, Rice had 147 graduates.) It also had a more serious, even at times somber, tone. The Great War had ended only the November before and Rice had not escaped its effects. Both faculty and students had enlisted and served in the military and the campus itself resembled a military camp for part of the war. Talk of the war and its aftermath dominated much of this reunion. In the evening the group reconvened for a seated dinner in the commons, which “fulfilled every expectation of what an ideal Thanksgiving feed should be.” Captain Baker served as toastmaster and each speaker talked of the war. Physics professor H.A. Wilson, who had served in the anti-submarine service, talked about the growing role of scientists in warfare. Stockton Axson of the English department described the humanitarian efforts, in particular the work of the Belgian Relief Commission, in easing the condition of Europe’s civilian population. German professor Lindsey Blayney, who had been a colonel in the American Expeditionary Forces, called for the nation to face its postwar problems as forthrightly as the AEF had faced its fight. Rice alums–both male and female–described the performance of Rice students in the field. In a discussion of “Religion at the Front,” another alum drew a sharp contrast between trading a promise of future piety for physical safety on the battlefront and coming to a real understanding of our place in the universe. Finally, after some brief remarks by President Lovett, the long day ended with a midnight bonfire. The reunion was considered a great success, and plans to make it a tradition were soon laid. This seems to have worked out pretty well. Thanks for the Thanksgiving post!